A total solar eclipse will sweep across the U.S. on Aug. 21, and millions of Americans will flock to cities along the line of totality to experience darkness in the middle of the day. Remember the Great American Solar Eclipse with these t-shirts featuring cities along the path of totality. Buy Great American Total Solar Eclipse 2017 T-Shirt here. Why we love it: This shirt is available in men's, women's and kids' sizes in a variety of different colors. Buy Corvallis, Oregon solar eclipse t-shirt here. Why we love it: This design illustrates the path of totality over Oregon and lists several cities and towns along that path. Buy Oregon solar eclipse t-shirt here. Why we love it: The impressionistic representation of the total solar eclipse looks pretty wild, with the sun's corona dancing around the moon. 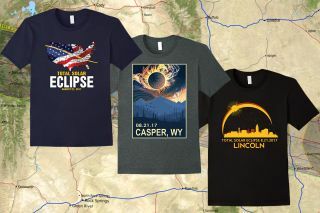 Buy Casper, Wyoming solar eclipse t-shirt here. Why we love it: This illustration doesn't show complete totality, but rather the so-called "diamond ring effect," in which a tiny bead of light is visible in the few seconds before and after totality. Buy Lincoln, Nebraska solar eclipse t-shirt here. Why we love it: This design features the Kansas City skyline beneath the solar eclipse. It also depicts a phase of the eclipse called "Baily's beads," or the diamond ring effect, in which a tiny point of light appears just before and after totality. Buy Kansas City, Missouri solar eclipse t-shirt here. Why we love it: Carbondale will experience totality for longer than any other place in the U.S. during the solar eclipse, with 2 minutes and 40 seconds of darkness. No Carbondale eclipse shirt is complete without that bit of information on there. Buy Carbondale, Illinois solar eclipse t-shirt here. Buy Nashville, Tennessee solar eclipse t-shirt here. Why we love it: Rather than showing the moon in front of the sun, this shirt has a round image of the Great Smoky Mountains surrounded by the sun's corona. Buy Great Smoky Mountains National Park solar eclipse t-shirt here. Why we love it: Ordinarily South Carolina's flag features a crescent moon, but this eclipse design is clearly way cooler! Buy South Carolina solar eclipse t-shirt here.